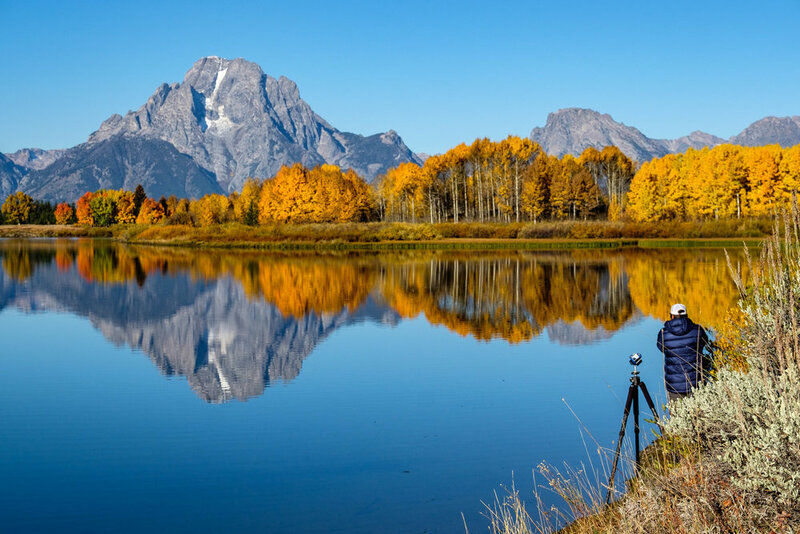 To say that Grand Teton National Park is an iconic photography destination is almost an understatement. 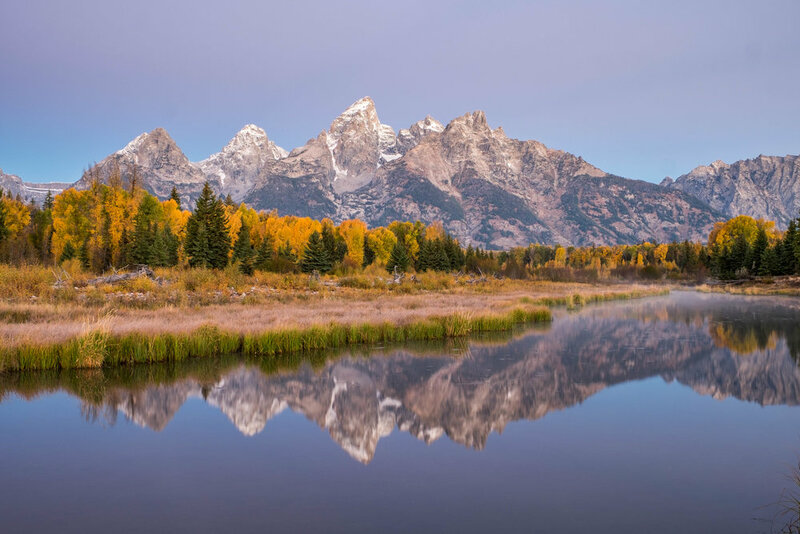 The jagged peaks of the Teton Range, along with the stunning natural beauty and wild animals on the valley floor, have long lured photographers from around the world. 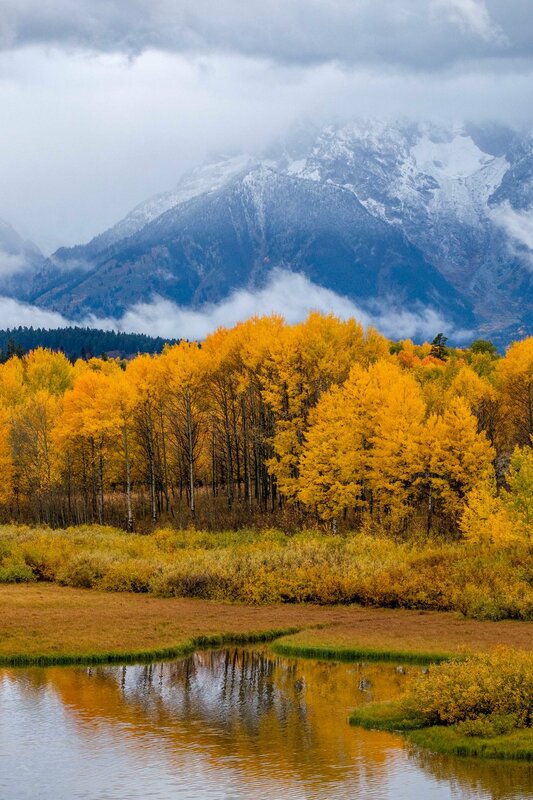 In particular, the arrival of autumn, when the aspen trees explode in extraordinary hues of yellows, oranges, and reds, makes this park one of the finest places to take pictures in the world. We timed our visit to coincide with this explosion of color, and it did not disappoint. Whether you are visiting during the fall or any other time of year, there are endless opportunities to photograph the incredible. Here are a few suggestions for some great locations to shoot within this dynamic national park. 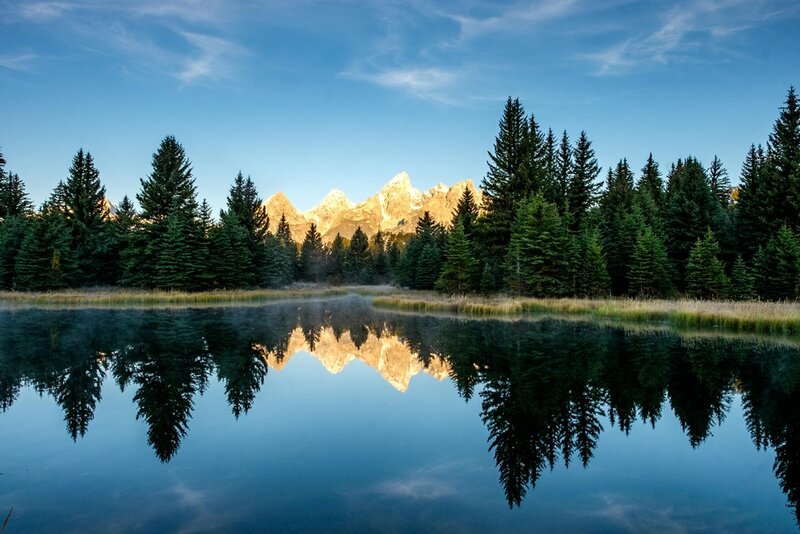 The first moment you set eyes on Oxbow Bend, you can hardly believe it is real. The scene is so stunning…so jaw-dropping…that it seems unreal. Or, you may believe it was the work of divine creation; or that you stepped into a dream. It is a fine place and stands among the most beautiful landscapes I’ve ever had the privilege of photographing. What to shoot: The main shot here is looking down the Snake River to the distant Teton Range, and catching the range (in particular, Mount Moran) reflected in the water. How to get here: The turnoff is located in between Jackson Lake and the Moran entrance station (closer to Jackson Lake) on the north side of the park. It will be hard to miss this turnoff, not only because of the incredible beauty, but also because of the crowds that gather here. At any time of day there will be tourists, photographers, sightseers, etc. there to see this amazing spectacle. Location tip: A lot of photographers congregate around the turnoff, however, having scoped this location out from every angle, I don’t think this is the ideal location to shoot this scene (also, if you don’t arrive 1 to 2 hours early you will not get a spot due to overcrowding.) There is a very small space where you can get the money shot about 100 yards down the road (to the right of the turnoff.) There is plenty of space to setup there, and you can get close to the water for more complete and unobstructed reflections. 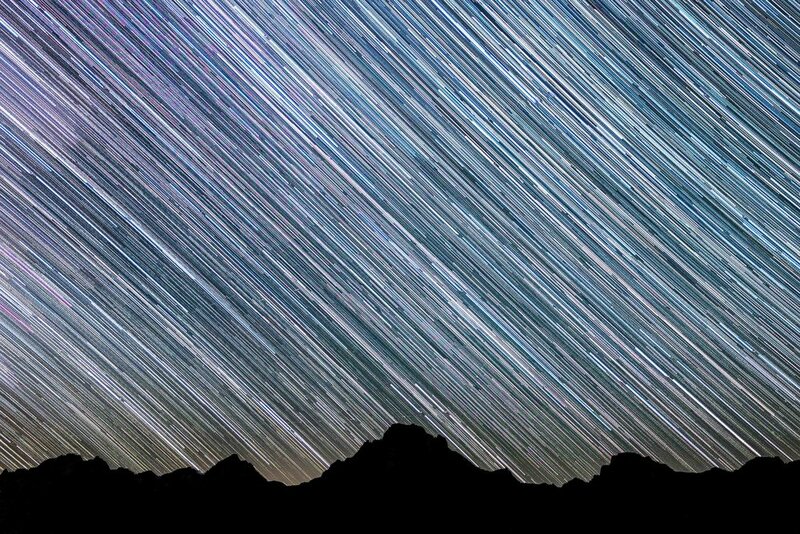 You won’t also have to worry about anyone stepping in front of a long exposure, which happens a lot near the turnoff. Best time to shoot: This is a sunrise location, and is best-photographed early- to mid-morning. However, stunning images can be captured any time of day. Equipment suggestions: A mid range wide-angle lens (in the 35-50mm range) is best for capturing the scene. I also liked having a longer lens (in the 70-200mm range) for distant subjects and to isolate parts of the scene that are quite interesting. A tripod is a must for low-light (early morning) shots, and I suggest bracketed at least one stop +/- in order to capture the full dynamic range. The colors of fall explode at Schwabachers Landing. Another awesome location within the park is called Schwabachers Landing. This area is used as a launch location for boaters and fisherman seeking access the Snake River, and it also happens to be a stunning location for photography. 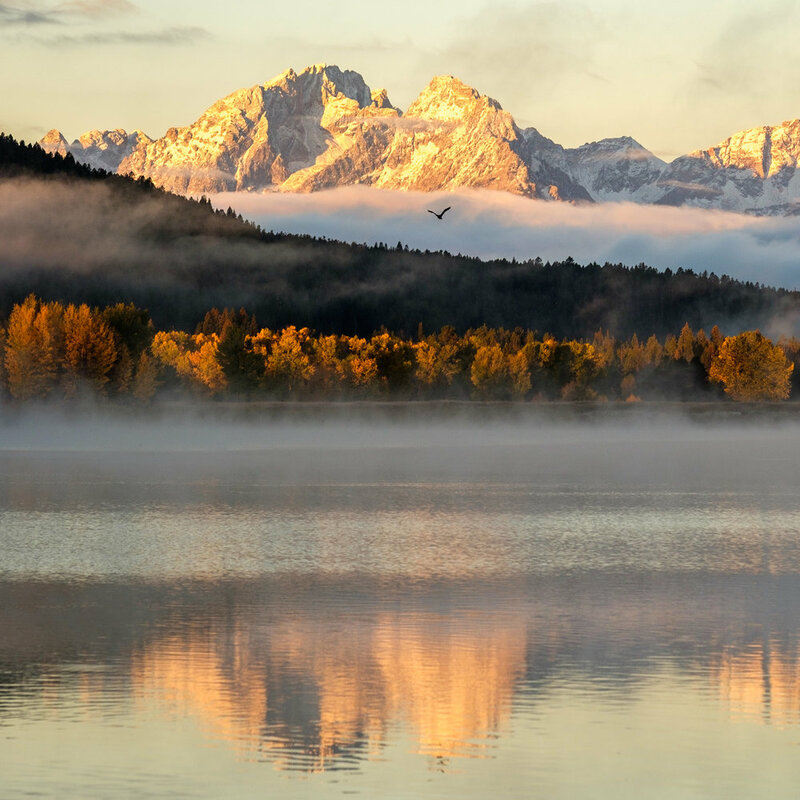 What to shoot: Once again, the Teton Range serves as the backdrop here for calm water reflections. A variety of pools and forested areas provides many opportunities for creative compositions. 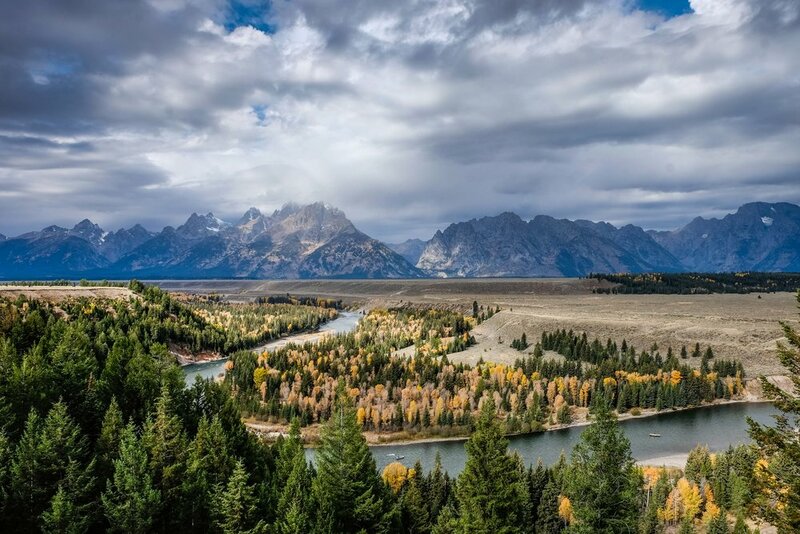 How to get here: Schwabachers Landing is located about 2 miles south of the Snake River Overlook, and 5 miles north of Moose, WY along highway 191. There is a nondescript dirt road leading down to the landing, just north of the Glacier View Turnout. You might miss it the first time you pass, but once you’ve been there it is pretty easy to find the second time. 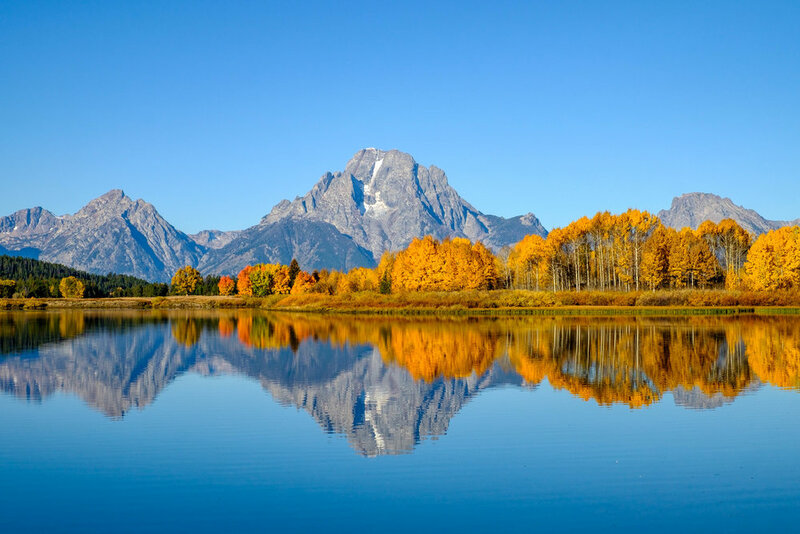 Location tip: I would say that there are actually three separate locations here to shoot, all with their own unique attributes (although they all frame the Teton Range). The first is accessed from the main parking area, at the end of the road. 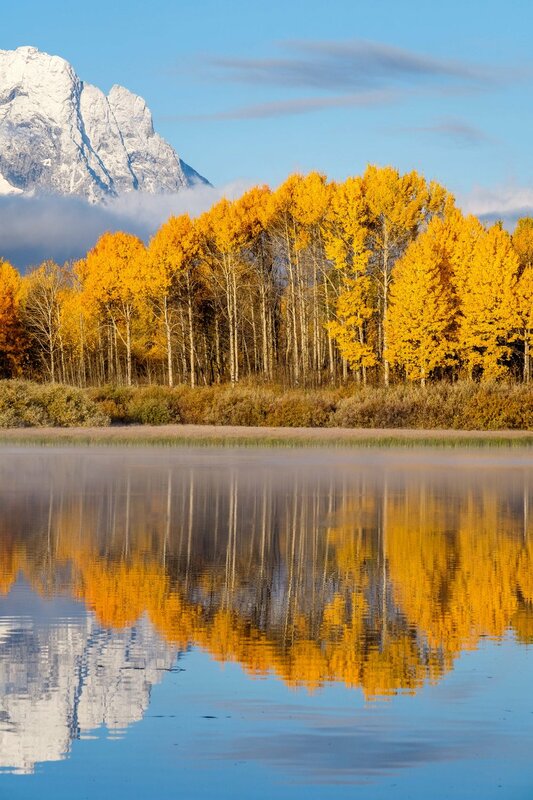 From there, you can shoot a beautiful reflection of the Teton Range. Most people never leave that area. If you walk down the path about 100 yards you will come to an equally impressive and much less visited spot, which I will call Schwabachers #2. The active beavers in the area have created a dam that allows for calm water in a beautiful pool that provides excellent reflections of the distant mountains. I recommend going there first and then working back to the main area. The last spot, Schwabachers #3, is located near a small parking lot on the same road, before you reach the end (where the main shooting area is.) You have to pass this spot to get to the main area, and you might not think there is much there, as all the cars will be parked further down. This location provides yet another area for creative water reflections of the distant Teton Range, and the great beaver dam adds a nice leading line. Best time to shoot: This is a sunrise location, and is best photographed before sunrise (alpenglow!) and just after sunrise when the peaks start to become lit by sunlight. Once again, don’t be afraid to stop here any time of day as the reflections can be beautiful even at midday. Equipment suggestions: A wide-angle lens (in the 16mm to 24mm range) is best for capturing the wide view here (at all three locations). A tripod is also highly recommended. The Snake River Overlook was famously photographed by Ansel Adams. Who can forget to Ansel Adams’ famous Snake River Overlook image? It has inspired endless amateur and professionals alike to try their hand at capturing such beauty found in nature. It certainly has inspired me, and that is why half the fun of taking this shot is simply knowing that Ansel once stood in the very place that you are standing when you visit there—that alone is worth the price of admission. What to shoot: Like Ansel’s visionary image, the shot here is to try and capture the Snake River as it bends into the horizon, back dropped by the Teton mountain range. How to get here: The overlook is located about 8 miles north of Moose, WY, off highway 191. Location tip: Ansel shot his famous image over 70 years ago, and the trees have grown and obstructed much of the view in the passing years. It will be near impossible to create his same shot, but try getting as high as possible to bring as much of the Snake River out from the treeline. Trees or not, it is still an incredibly beautiful scene. Best time to shoot: While sunrise can be a popular time to photograph here, I preferred the late afternoon light on a cloudy/overcast/stormy day. I love the moodiness the clouds can bring, and the opportunities for rays breaking through the clouds and highlighting different features of the scene. I patiently waited for weather and I believe it was the right call. Equipment suggestions: A wide-angle lens (in the 24-35 mm range) is best for the scene here. While most photographers don’t own this, I have the MegaMast Carbon Fiber Camera Stand, which is a monster carbon fiber tripod that can extend up to 27’ in the air. I love this thing, and I only use it for situations like this where I want a different shot. I also get a ton of snickers and onlookers who have never seen such a tall tripod. But I tell ya, it works really well! This is one way to get above the treeline to get this shot. The Snake River Overlook in black and white. The Moulton homesteads on Mormon Row at dawn. Mormon settlers from Idaho arrived to the Grand Teton area in the 1890’s, and clustered their farms together in what is known as the Gros Ventre/Antelope Flats area of the park. The relics of their once flourishing farms can still be seen today, and make for some incredible photography subjects. Mormon Row was added in 1997 to the National Register of Historic Places as a Historic District. It is indeed a historic, and very beautiful place. 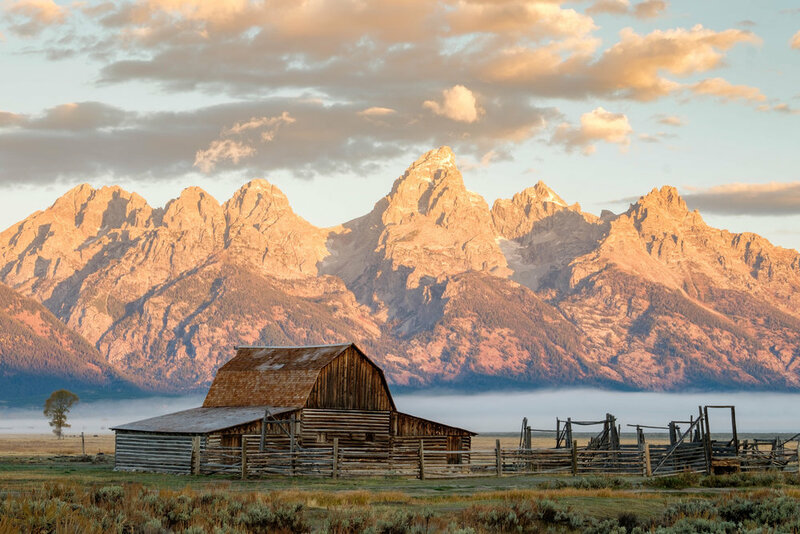 What to shoot: The barns on the Moulton homesteads with the Teton Range in the backdrop. How to get here: Driving north on highway 191, turn right onto Antelope Flats road just past Moose Junction. About a mile and a half down this road you will come to a small dirt road leading north/south in both directions (respectively). Turn left to park at the little parking area to access barn #1 (John Moulton barn), and turn right to get to barn #2 (T.A. Moulton barn). Location tip: There are two barns here that I thought were significant and beautiful shots: #1 is the John Moulton barn, and #2 is the T.A. Moulton barn. Both barns are easily accessed, and on adjacent homesteads. Truthfully, I was fonder of the John Moulton barn as I liked the shape of it and thought it composed better against the mountains, but I know some photographers prefer the T.A. Moulton barn. You can’t go wrong with either spot…they are both very photogenic. Best time to shoot: This is a sunrise location. I liked the alpenglow that occurs on the mountains right before sunrise, but first light is pretty special as well. Get here early (at least an hour before sunrise, preferably 1.5-2 hours), as this is a very busy sunrise photography location and there aren’t a ton of prime locations to setup your tripod. Equipment suggestions: A wide-angle lens (in the 21-24mm range) is best for capturing the barn backdropped by the mountains. I’d also bring a 70-200mm that you can use when you move back a bit at the John Moulton barn. A tripod is a must, and a graduated neutral density filter is highly recommended to properly expose the shadowed foreground when the light starts to hit the mountains. A Great Gray Owl next to an aspen tree in the Grand Tetons. I call this site “The Owl Area” because of the two beautiful Great Horned Owls I saw during one trip down the same road (I also couldn’t remember the name of the road for the longest time, but I've resolved that, see below.) There is a lot of wildlife in this area—when I was there parts of the road were closed to vehicle stopping because of recent bear activity; we saw elk as well, and of course, the majestic owl. What to shoot: Wildlife. This scenic drive passes through wetlands and forested areas that are rife with fauna and the backdrop is stunning. How to get here: One of the beautiful things about the Moose-Wilson Scenic Drive is that it is not as busy as a normal park scenic drive. I think that has to do with its location, which starts right before the main entrance station in Moose (if coming from the south.) It’s a dirt road that I think a lot of people simply pass it by... it turned out to be a place that we loved. Location tip: Go slow. Not only will you be trying to spot owls and other animals who are very well cloaked and elusive, but animals can run out in front of the car from the brush alongside the road at any moment. It helps to have a spotter with keen vision in addition to the driver, but you can spot while driving as well (just be careful.) Be sure to look to the tree branches that are 10 to 20 feet off the ground, where owls often sit while hunting prey. If you see an one in the distance, park your car in a pull-off (animal jams can happen quite quickly if you are not considerate) and go for a walk to try and get a bit closer. Best time to shoot: You can take this drive anytime, but I usually hit this around midday when the sun was too bright for other shooting. Most of the drive is through forested area, which provides nice shade from midday sun. Equipment suggestions: You really need a longer zoom to capture wildlife here. I loved having my 100-400mm, as it could handle most situations. As the forest can be in shade, don’t be afraid to bump your ISO up so you are getting shutter speeds in the 500 (minimum) range. If you want to see moose (who doesn’t?) the Gros Ventre campground is the place to go in Grand Teton National Park. You can see moose just about anywhere in the park, but this area is known for being as close as you can get to having a guaranteed sighting of a moose. What to shoot: Moose! In all their glory. How to get here: The Gros Ventre campground is located about 11 miles south and east of (appropriately named) Moose, WY, and is situated along the Gros Ventre River. 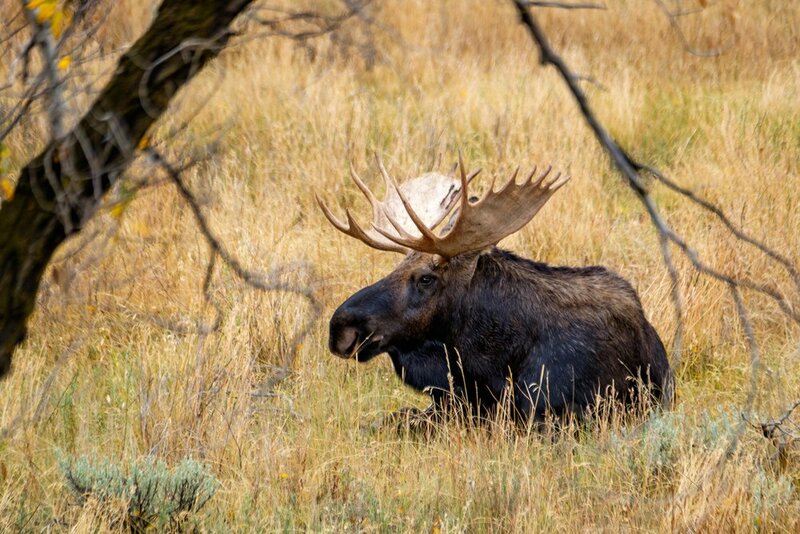 Location tip: The best spot to find the moose is along the road leading to the Gros Ventre campground (both before and after the campground entrance) eating and relaxing in the sagebrush and cottonwoods that grow along the Gros Ventre River. 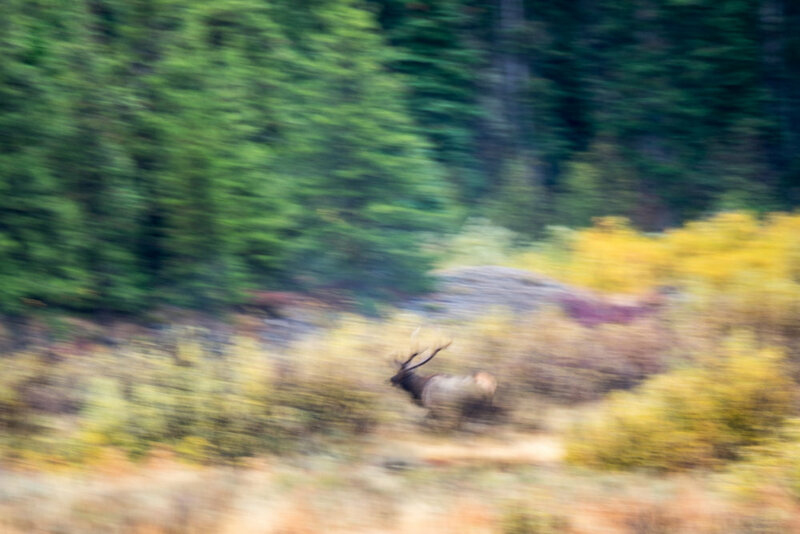 Best time to shoot: I found that mid to late afternoon was best to find the moose, but they can be there any time of day. Equipment suggestions: Although you are likely to get pretty close to the moose, I’d still suggest a longer zoom lens for wildlife shooting. I was perfectly happy with my 100-400mm, which I think will cover most scenarios you will run into at this location. You can always go longer, and wider, and I saw all sizes and types of lenses here. A word of caution: Be a careful and responsible wildlife viewer and stay at least the recommended 25 yards away from moose, and never position yourself between an adult and its offspring. These animals can be territorial and dangerous and you do not want to have an encounter with such a large animal. 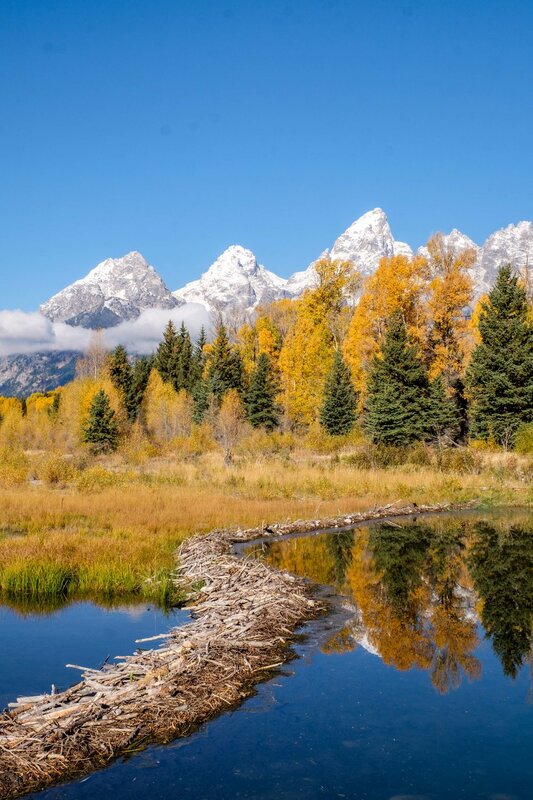 There’s so much to see, do, and photograph within Grand Teton National Park. This list could be endless! It is not meant to be a comprehensive itinerary, but a short and easy grouping to help you get to some of the very best views and wildlife areas in the park. Take a look at the gallery above for a deeper dive into the park in general. I welcome your corrections, updates, and personal tips/stories as well…feel free to send them to me at the following email address: jonathan.r.irish@gmail.com. Cheers! 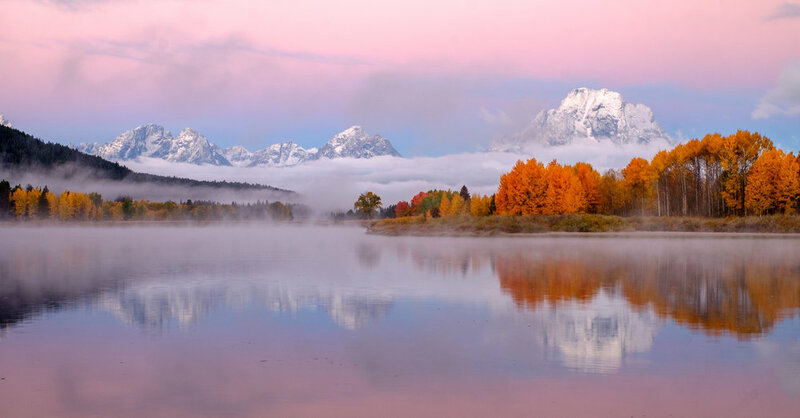 Oxbow Bend at sunrise during autumn. 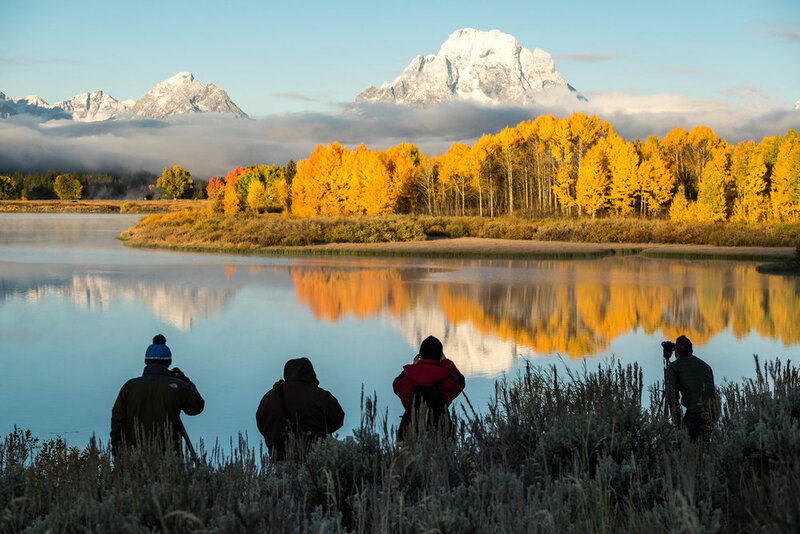 Iconic site in the park: Oxbow Bend is iconic both as a scenic viewpoint and as an opus for any landscape photographer. On any given morning at sunrise, you are likely to struggle for parking and personal space—and with good reason. The view looking over the Snake River with the glorious Mount Moran reflecting upon it is as picturesque and perfect as any other of the National Park system’s other most treasured viewpoints, including Artist Point at Yellowstone, Tunnel View at Yosemite, and the Wild Goose Island Overlook at Glacier. Constantly changing and moody weather creates a different scene each time, capturing the undivided and continued attention of photographers who travel from near and far to have their moment with the famed scene. 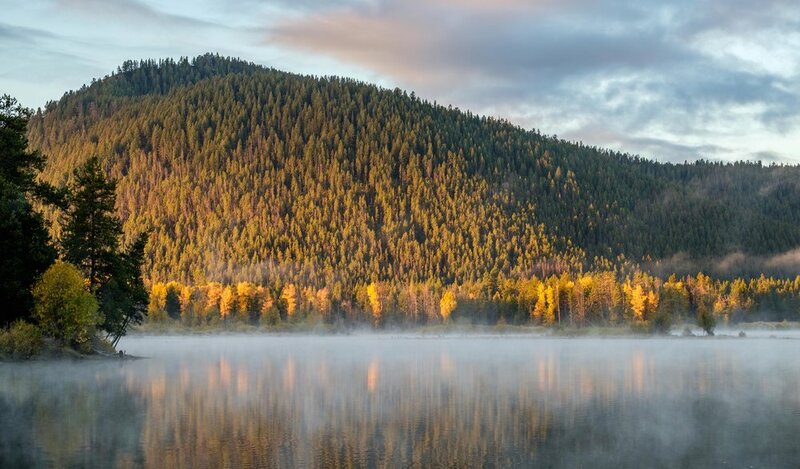 While this is an active area for wildlife, the serene setting will compete even the most casual viewer’s attention more intently than any elk, beaver, or any moose sighting possibly could. 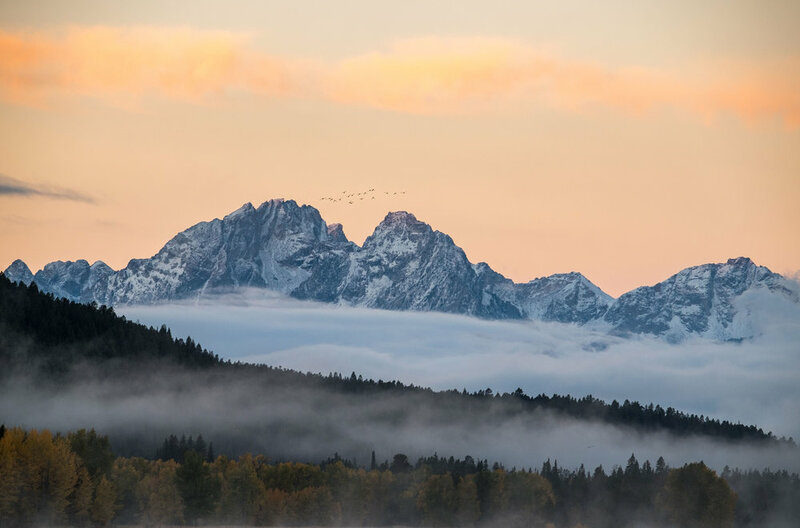 Given humanity’s innate enchantment with wild animal activity, that says a lot about the beauty you will find at Oxbow Bend. A paddler glides on the still waters of Jenny Lake. Accessible adventure: Jenny Lake is one of the most popular areas in the park because it offers something that every visitor can enjoy. 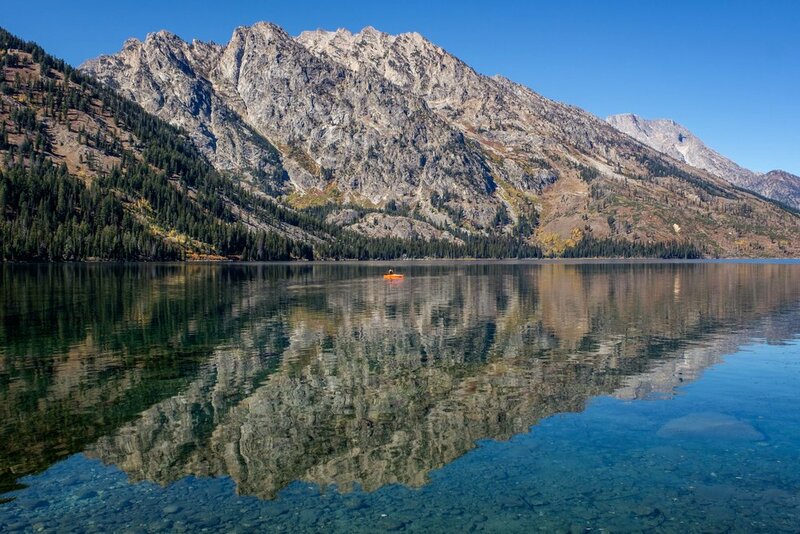 With nearly 2-square miles of pristine mountain water in its basin, and being one of the only two lakes where motorized vehicles are authorized to operate, it is a go-to in the Tetons for water sport play and is an ideal spot to throw down a kayak or stand up paddle board. It is also the jumping off point to backpacking and climbing excursions in the park. For leisure visitors, the Jenny Lake Loop hike that circumnavigates the lake offers choose-your-own-adventure style hiking on flat ground through forested woods allowing people to travel as far as they choose—up to 6.6-miles with only 700-feet of elevation gain—leading to popular areas like Hidden Falls and Inspiration Point. The area offers a nice mix of many things to do and is endlessly peaceful. 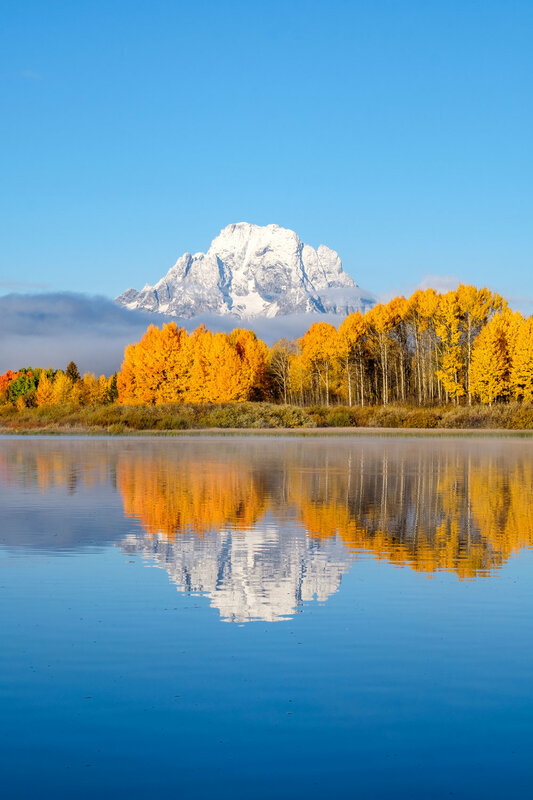 Big adventure: Grand Teton National Park is an ideal environment for big hiking—with elevation climbs in areas like Paintbrush and Garnet Canyons reaching 4,000ft; and more than 230 miles of maintained hiking trails accessible to adventurers during high season. When you head into the 40-mile long Grand Teton Range, you enter a wilderness where casual tourists in the area might as well be as far away as Mars as you disappear into a setting of jewel-like lakes, glacial cirques, sub-alpine meadows, and total solitude. Trails range from easy to strenuous and ascend mountain peaks in 16 separate areas that are designated for backpacking adventures—so you can get a good night of sleep under of the stars after a big day of hiking. There are endless approaches to tackling the Teton Range, which is considered by many to be among the most beautiful mountain ranges in the world. Jackson Hole is the name of the valley at the base of the Grand Teton mountains. The town of Jackson is located 12 miles southeast of Jackson Hole. The rocks in the park are some of the oldest in North America; while the Teton Range is one of the youngest in the Rockies and the world. The peaks were carved by ancient glaciers. They rise dramatically from the valley floor of Jackson Hole, 7,000-feet into the sky, without any obstruction from surrounding foothills. While the ancient glaciers have long been gone, 12 still remain on the mountaintops. Hiking, backpacking, paddling, cycling, rock climbing, fishing, wildlife viewing, winter sports, and photography are all popular activities in the park. Fall foliage! Brilliant in the Tetons. 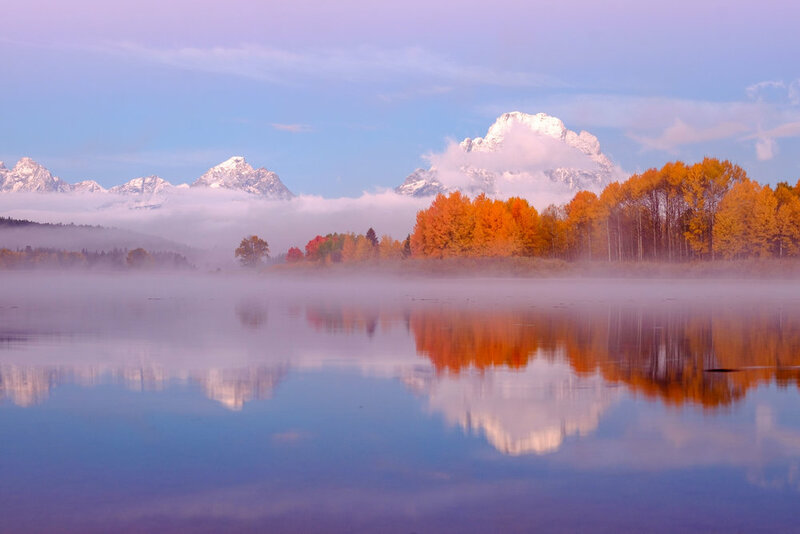 This park is one of the great places to see the annual fall foliage in the U.S.
A bike path was created in 2009 to provide a safe path for cyclists between the town of Jackson and the park, where it ends at Jenny Lake. This is great Park for winter sport! Park rangers lead guided snowshoe adventures between December and March, snowmobiling is allowed in designated areas, cross-country skiing and snowboarding are popular during long and snowy winters, as is ice fishing in frozen alpine lakes that number beyond 100 in the park. 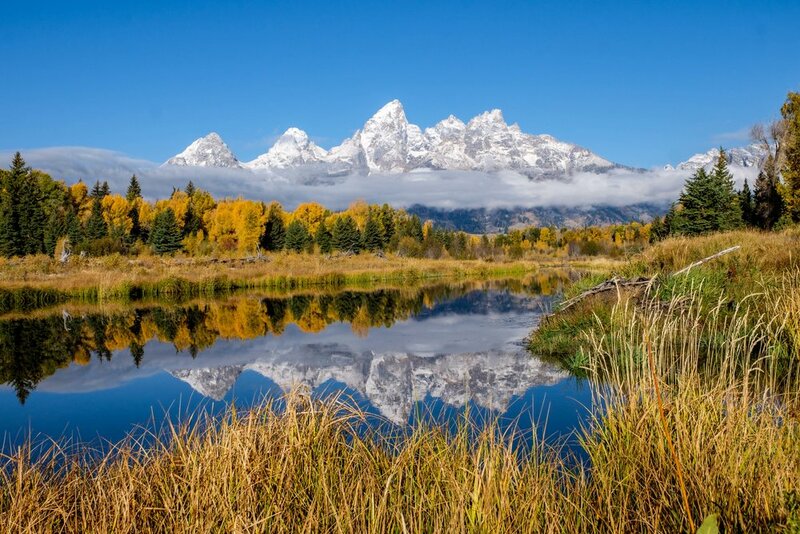 The Grand Teton Range is crowned by its highest peak, Grand Teton, standing at 13,775-feet. Nine other peaks in the park rise over 12,000 feet. An elk crossing the Snake River. Grand Teton is home to more than 360 species of animals. There are more than 61 mammal species in the park including brown bear, moose, elk, bison, coyote, pronghorn and mule deer. Teton is also one of the best places to view elk and their fascinating displays during their annual mating season (called "rut") each fall. The largest wintering elk herd can be found at Grand Teton National Park. The elk rut occurs during September and October. At this time of year in Grand Teton (as well as in Rocky Mountain National Park in Colorado) the call of the elk bugle hangs on the horizon... it is completely hypnotic. The largest bird, the trumpeter swan, and the smallest bird, the calliope hummingbird, in North America can both be found at Grand Tetons National Park. The Snake River was called "The Mad River" by early settlers in the area. It joins the Columbia River watershed, which runs through North Cascades National Park and Mount Rainier National Park, both in Washington State. A historic ranching area, Jackson Hole is where the name “Dude Ranch” began. John Colter, who was the first recorded explorer of this area of European descent, was also one of the first explorers at Yellowstone. Colter, a member of the Lew and Clark Expedition, is often referred to as the first "mountain man." Evidence shows that transient hunter/gatherer native American tribes in the area dating back 11,000 years. In 1943, a cattle-drive protest 500-strong trampled lands newly protected by President Franklin Delano Roosevelt, an effort led by the actor Wallace Beery. Local ranchers were protesting the newly minted Jackson Hole National Monument identification awarded by presidential proclamation that same year. Historic Mormon Row at sunrise with the Grand Tetons in the background. Mormon settlers arrived to Jackson Hole by way of Idaho in the 1890s, establishing 27 homesteads that are collectively called today “Mormon Row” (and Grovont by the U.S. Post Office.) Mormon Row Historic District was added to the National Register of Historic Places in 1997. It is one of the best places in the park for sunrise photography. Scenes from the film Rocky IV film meant to depict the Russian countryside were filmed near Jackson Hole. Grand Teton is the only national park with a commercial airport within its boundaries. The Jackson Hole Airport was built in the 1930s and is assigned to the Jackson Hole National Monument. 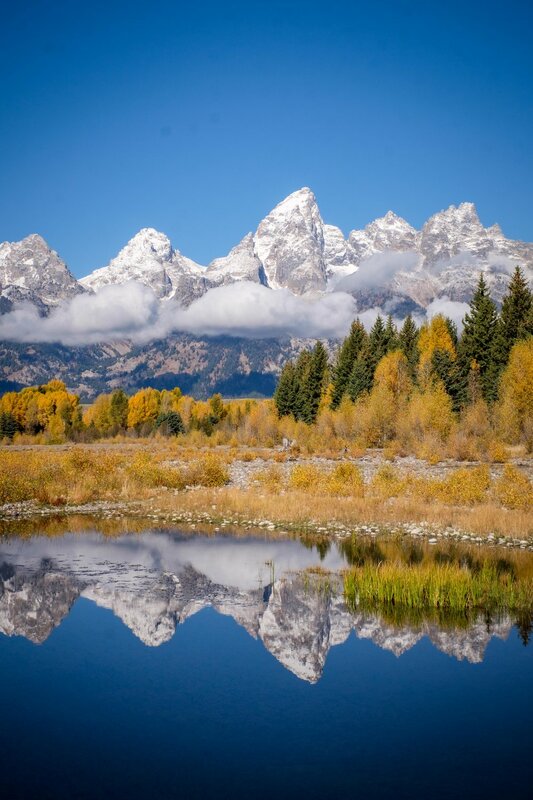 John D. Rockefeller, who was at one time the richest man in the world, started to buy up land in Jackson Hole at the base of the Tetons the way he had before at Acadia National Park in Maine. It was more or less considered to be a political maneuver used as a way to increase the area of national parks already established. 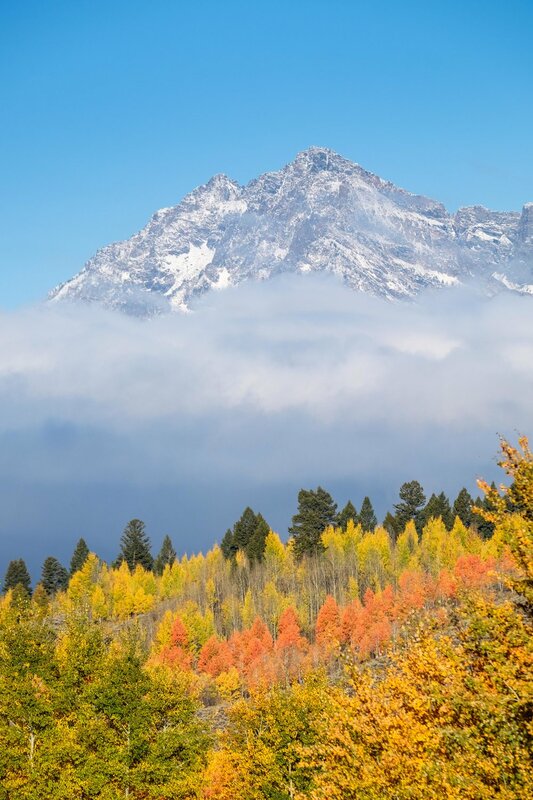 By the time he handed his property over to the U.S. government to be included in Grand Teton National Park, he had 221,00 acres, which nearly tripled its size. In 1950, the park was expanded to include the areas that were purchased by Rockefeller, areas that we love to explore today. 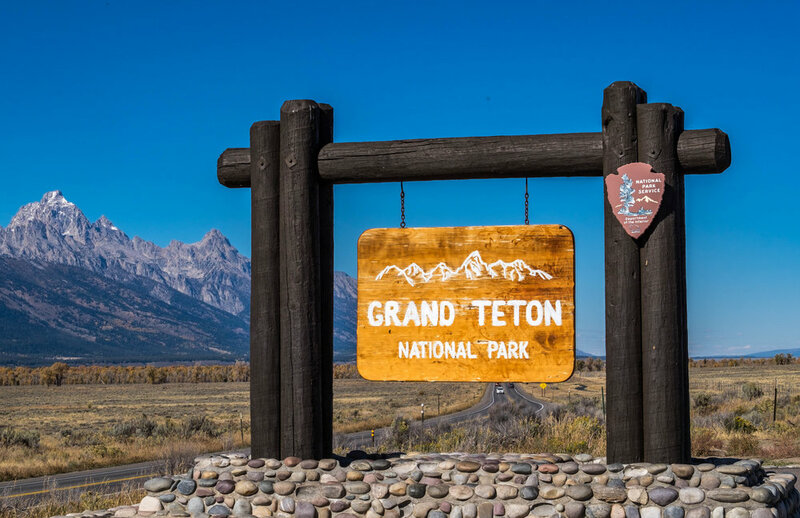 The northern border of Grand Tetons National Park shares a southern border with Yellowstone National Park, they are connected by the John D. Rockefeller, Jr. Memorial Parkway which was built in 1972 as a way to increase visitation to both parks. These areas along with 18 million-acres of national forested land make up the Greater Yellowstone Ecosystem. This is one of America’s busiest national parks and is also very much a seasonal one, and as such, space fills up quickly each year from May through September. 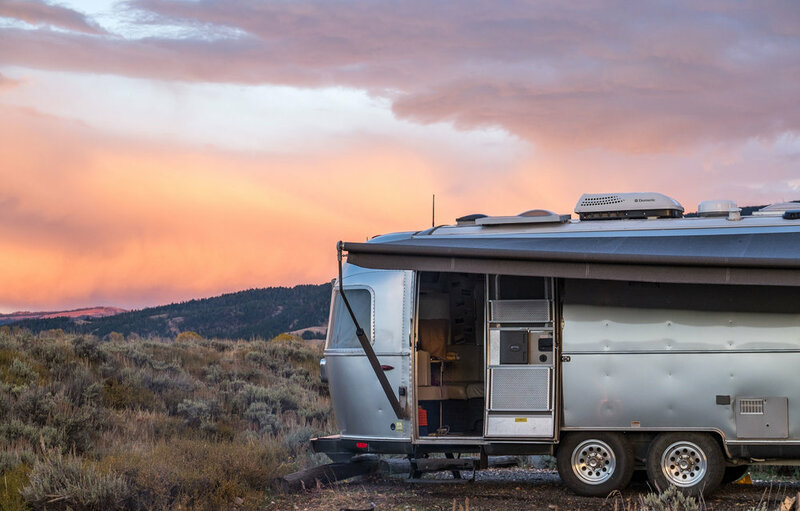 There are several lodges, campgrounds, and an RV site where Wally the Airstream felt very happy, at the Colter Bay Village. Grand Teton National Park welcomes approximately 2.5-million visitors each year, a really high number for a relatively small park! Wally the Airstream en route to the Gros Ventre campground. One of the entrance signs to Grand Teton National Park.